If you find it hard to find an affordable apartment or house in the US, you're not alone. For the past several years, the country has been suffering from an affordable housing crisis, making it especially difficult for an estimated 11.4 million extremely low-income (ELI) American households to find places to live. ELI households are defined as those earning below the poverty line or 30% of the area's average median income — whichever is higher. From 2007 to 2013, the number of low-income households increased 18%, but funding for the largest federal housing programs remain below 2008 levels. HUD, the housing agency that funds anti-poverty efforts, could lose approximately $6.2 billion next year if the Trump administration's budget is approved. While there is a nationwide shortage of affordable housing, some states are worse off than others. 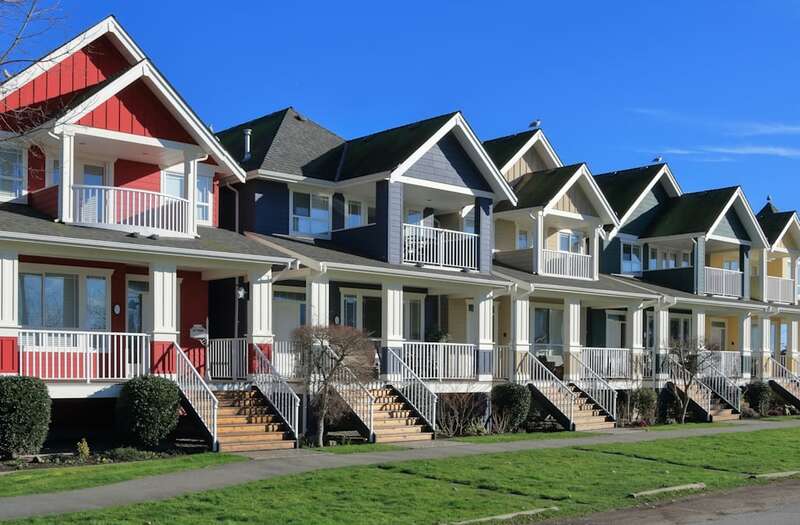 That's a reality reflected in a new report by the National Low Income Housing Coalition, which analyzed the availability of affordable housing in every state. The report defines an affordable housing deficit as when ELI households must spend more than 30% of their incomes on rent and utilities. Eight states have fewer than 30 affordable homes available per 100 households in extreme poverty, according to the report. Check out these states and the full map below. Texas has approximately 29 affordable homes available per 100 ELI renters. New Jersey has approximately 29 affordable homes available per 100 ELI renters. Florida has approximately 27 affordable homes available per 100 ELI renters. Colorado has approximately 27 affordable homes available per 100 ELI renters. Arizona has approximately 26 affordable homes available per 100 ELI renters. Oregon has approximately 26 affordable homes available per 100 ELI renters. 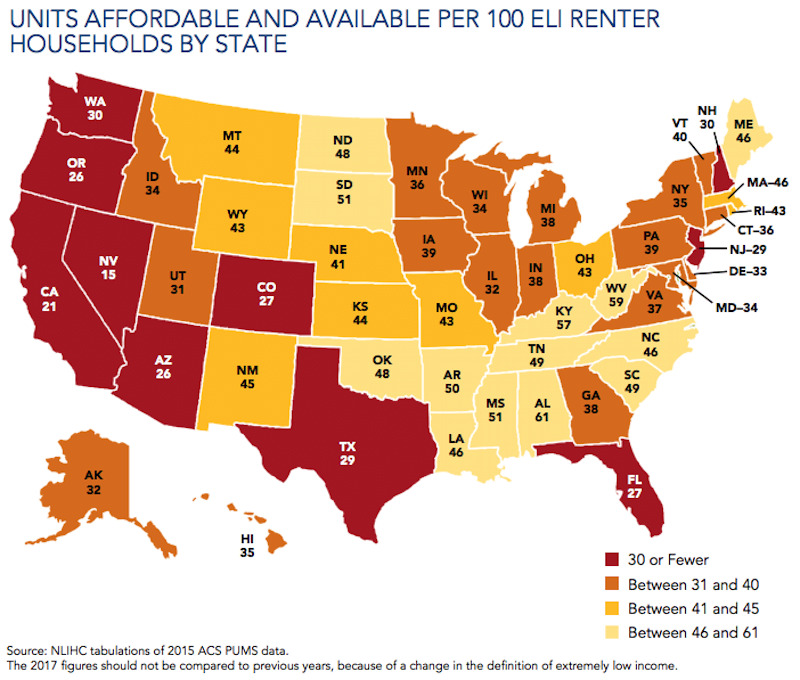 California has approximately 21 affordable homes available per 100 ELI renters. There is a dire shortage of affordable housing in Nevada, where just 15 homes are available per 100 ELI renters. As CityLab notes, Nevada experienced an economic boost after the 2008 recession, but the state's housing market hasn't kept up with its recent influx of new residents, especially in cities like Las Vegas and Reno. Affordable housing is easiest to come by in Alabama, but there's still a shortage. For every 100 ELI renters there, there are 61 affordable units. Here's the full map, which shows the affordable homes available per 100 households living in extreme poverty. Nationally, there are 35 affordable homes available per 100 ELI renters. Check out the report here and more information about the ASPE Poverty Guidelines here.